In a recent article published in Physical Review Letters a research collaborative has reported new insights into the electronic conduction and interference on 2-D topological insulators—an exotic kind of insulator that conducts only at the edge and that could be key for the development of a new generation of electronic devices. For decades, insulating materials were thought to be a boring subject from an electronics point of view, since electrons are immobile and cannot contribute to electrical conduction. Recently, researchers proposed a different class of insulator and experimentally found it. They're called "topological insulators," as their electronic structure can be mathematically classified differently than conventional insulators. A fascinating property of topological insulators is that while remaining insulating in the bulk, they are very good conductors at the edge. 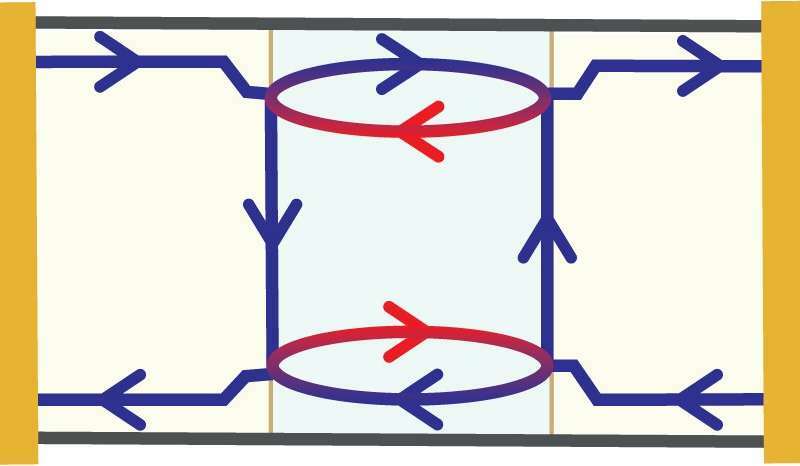 At those edges, electrons travel in quantum channels in either direction, as in a two- lane highway. Also like a highway, U-turns are forbidden—electrons on the edge cannot change direction without breaking the rules. The application of an external magnetic field lifts this prohibition and allows electrons to turn. The recently published research reveals the interplay of quantum edge states across a lateral junction in a HgTe quantum well, a canonical 2-D topological insulator. From their results, the researchers extracted new information on the fundamental properties of topological edge states and proposed strategies to fine-tune their interaction. "In our work, we tested the consequences of electron U-turns in the conduction of our devices. We also showed how under certain circumstances, electrons allowed to turn seem to do it in an orderly manner, as if in some kind of roundabout, generating a constructive interference," Calvo explains. This work contributes new insight into the fundamental properties of the edge states and their conduction properties in 2-D-topological insulators. Such proposals to control the properties and interactions of these states are key for their application in the development of a new generation of electronic devices based on quantum fundamental properties of materials.